Perceptional similarities of academic fraternity on workplace ethics at higher education institutions is discussed in this paper. Mainly the high disparities and proximities in perceptions referring to three variables of workplace ethics such as ethical compliance, fairness, and trust are deliberated. Survey of 115 teaching and academic administration staff at ten universities in Saudi Arabia revealed that the academic staff positively perceived the ethical practices at workplace that associated with the three variables. However, high discrepancy and less propinquity ensued in their overall optimistic perceptions. Extra high disparities in perceptions resulted with regard to trust at workplace than regarding ethical compliance and fairness. Teaching staff had few additional high differences on ethical compliance and trust. Academic administration staff highly differed regarding fairness related ethical practices. Both male and female staff spared high differences regarding trust related ethical practices. Those tenured less than 10 years largely more conflicted in their views on trust and ethical compliance. Whereas tenured 10 years or more exhibited few extra high variations on trust and fairness related workplace ethics. Conversely, great proximity in the opinions was experiential among the teachers and female staff with regard to three variables. No contiguity within the academic administrators and those tenured 10 years or more. Implication of this study is to realize and fetch the unanimity in the academic staff for the successful implementation of ethical practices at workplace to sustain the ethical work culture. Academic Staff, Ethical Behaviour, Ethical Practices, Higher Education, Moral Character, Work Culture, Workplace Ethics. Workplace ethics are moral values for proper conduct at work (Blum, 1988). They are norms of work culture and morals of people at work. However, the implications of workplace ethics have altered scopes by leadership styles, gender stereotypes, moral intensities, and moral characters of people at workplace (Heilman, 2012). Ethics at workplace are experiential in several forms as they often appear to be political in nature without any indication or evidence (Cohen & Vigoda, 1999; Dandan & Marques, 2017). Therefore, organizations would appeal uniformity in ethical behaviour of employees to sustain the ethical work culture (Ergas, 2017). However, autonomy of employees towards organization’s ethical practices is crucial to withstand the ethical work culture. In this context, perceptions of academic staff on workplace ethics is discussed in this paper by a survey at selected universities in Saudi Arabia where ethics are well defined by Islamic law ‘Sharia’ and the work culture is emulated by the age-old Islamic culture as instinctive from religious movements (Khan, 2014). This paper deliberated the major abnormalities in terms of high discrepancies and close propinquities in the perceptions of academic staff regarding three variables of workplace ethics such as ethical compliance, fairness and trust. Olson (2013) proposed three variables of workplace ethics that would shape the ethical work culture of organizations such as ethical compliance, fairness and trust. Researchers reinforced these three variables and discussed their implications as follows. It is the practice of norms and values by employees of organizations based on expectations of society. Schwartz (2011) find that a minimal ethical compliance would exist in the organizations by the differences in the awareness levels on workplace ethics and it reveal that once the employees are conscious of ethics at workplace they are less affordable to comply with ethical practices of organizations. Thomas & Kamalanabhan (2012) suggest that workplace ethics is highly needed for greater self-compliance among employees. Ngang & Chan (2015) argue that for greater ethical compliance at workplace it is desirable to extricate the employee’s views on workplace ethics before they join the organizations. Nair et al., 2017 appeal that organization’s efforts to vigilant the employees on disasters at big corporations like Enron and the other corporate scandals that occurred around the world would rather demand the employees to uphold high ethical compliance at workplace. Fairness is the equity and justice over the organization policies and decisions that would affect the employee’s behaviours and work culture. Putranta and Kingshott (2010) emphasize that fairness of employees in organizations would nurture the positive work culture. Gilliland and Langdon (1998) make known that fairness of employees would remain central to several decisions that include compensations, discipline, ethical behaviour of employees, payoffs and so on. Meanwhile, Grant and Ashford (2008) find that employees would always link organizational fairness with the acumen of superiors in the remunerations and reward systems and accordingly they would discern the organizational justice to expend their efforts. Cohen-Charash & Mueller (2007) identify that there is counterproductive work behaviour in the organizations due to unfairness in the decisions of superiors and high levels of envy among the people at work. Trust is the mutual assessment of employee’s ethical characters at workplace. Phillips et al. (2014) specify that trust among employees is central to ethical work life and it develops the moral characters and suitable group behaviours among the employees at workplace. According to Darley et al. (1998) trust would advance the effective relationships of employees of different levels and it would enhance the coordination at work. Alias et al. (2013) expose that employee had inflated concern on trust related behavioural traits to reciprocate the healthier relationships and as a result less deviant behaviour survived among them for a long time. Thau et al. (2007) signify that employees would demonstrate rebellious behaviours in case of minimal trust in superiors or because of less belongingness among fellow workers. Perceptions of academic staff are measured by using multidimensional scaling (MDS) technique (Ferguson et al., 1997). Survey on three variables completed with a questionnaire. Ten items in each variable as appended to this paper are prepared by the authors on general practices of organizations on workplace ethics. Responses obtained on five point Likert’s scale from strongly agree (5) to strongly disagree (1). Alpha values are between 0.732 and 0.891 for three items and for all the items it is 0.812. Data of participant’s occupation, gender, and tenure is collected. This study discussed the major perceptional similarities in terms of number of high disparities and close proximities that resulted in connection with study variables based on socio-demographic profile of sample of academic staff. Teaching staff and academic administration staff of ten universities in Saudi Arabia chosen as the sample of this study. Teaching staff held positions of teaching assistant, lecturer, assistant professor, associate professor, and professor. Academic administration staff is deans of faculties, heads of departments, or members of academic committees of universities. By stratified random sampling 400 questionnaires are circulated and 115 are returned (57.5%). Of the total by occupation 93 (81%) are teaching staff and 22 (19%) academic administration staff. By gender, male staff 85 (74%), female staff 30 (26%). Tenured less than 10 years are 83 (72%) and tenured 10 years or more are 32 (28%). Responses to questionnaire entered in SPSS to get results by using MDS technique. “Euclidean distances (d)” between items measured in two-dimensional spaces. The values of d>3.000 for the paired comparison of items in optimally scaled matrices were picked and counted to sort out the number of high disparities in the perceptions. Similarly, the values of d<1.000 were also picked and totalled to separate the total number of close proximities resulted in the perceptions. All such values totalled exclusively for the items attributed to each variable based on occupation, gender, and tenure. These values mapped in the radar Figures 1 and 2. However, to bias the concerns of colour contrast to view the figures, data tables (Tables 1 & 2) showed for the Figures. Variance is measured by Young’s S-stress and r-squared correlation (RSQ) at least convergence (0.001) with minimum S-stress (0.005) until 30 iterations and the resulted values were shown in Table 3. Table 4 has values of descriptive statistics. Means and standard deviations of items appended to this paper. S-STRESS AND RSQ VALUES IN THREE STUDY VARIABLES. Teaching Admin. Male Female Tenure<10 yrs. Tenure>10 yrs. Teaching Admin. Male Female Tenure<10 yrs. Tenure>=10 yrs. As in Figure 1, high perceptional disparities (13) resulted in overall perceptions of academic staff on ethical practices related to three variables such as ethical compliance, fairness, and trust. As indicated in the outer loop of Figure 1, academic administrators (18) differed highly than teachers (16). Higher number of inconsistencies identified among female staff (19) than male staff (15). Tenured less than 10 years (20) had further high disparities than tenured 10 years or more (14). In the variables, the inner loops of Figure 1 showed that majority of the mandated high differences in perceptions conferred to trust (7) followed by ethical compliance (3) and fairness (3). In ethical compliance, teachers (7) had extra inconsistency in their opinions than academic administrators (6). Similar tendency found among male staff (4) and female staff (3). Tenured less than 10 years (7) highly disengaged on ethical compliance than tenured 10 years or more (2). In fairness, academic administrators (9) had high differences than teachers (5). Female staff (8) differed additionally higher than male staff (3). Tenured 10 years or more (5) had uneven views than tenured less than 10 years (4). Regarding trust, teachers (4) showed more volatility than academic administrators (3). However, increased number of high discrepancies in trust intervened by gender and tenure. These differences were a bit of supplementary among male staff (9) than female staff (7). This tendency also little added among tenured less than 10 years (9) than tenured 10 years or more (7). Figure 2 shows close proximities in perceptions. Mainstream of values for total sample squeezed at centre of the Figure as such less number of propinquities (5) tracked in the overall perceptions of academic staff. Teachers (21) had more consistency than academic administrators (3). Female staff (19) highly connected in their views than male (3). Tenured less than 10 years (9) exceptionally near in their feelings than tenured 10 years or more (5). In the variables, teachers had close insights on ethical compliance (14) than on fairness (5) and trust (2). Academic administrators (0) and tenured 10 years or more (0) not showed intimacy in their views upon fairness. Female staff had closer state of mind about trust (10) than about fairness (5) and ethical compliance (4). Tenured less than 10 years had proximity in fairness (6) than in trust (2) and ethical compliance (1). As in Table 1, significant variance (RSQ) resulted only in trust (0.783). This result might be the consequence of excessive high disparities ensued among male staff (0.799), teachers (0.786), and tenured 10 years or more (0.763). No significant variance originated in fairness (0.833) except some significant variance among the teachers (0.717) and tenured 10 years or more (0.749). Similarly, there was no significant variance acknowledged in ethical compliance (0.865) except some significant variance contributed by academic administrators (0.798) and female staff (0.735). Stress values in three variables not significant due to distinctly compelled high disparities intrigued in the overall perceptions. Values in Table 4 showed that this study expected statistically significant variance in the perceptions of teachers and academic administrators (t=2.77; p=0.01). Significant deviance anticipated in fairness (t=2.45; p=0.02) and trust (t=2.41; p=0.02). These values armoured with the outcomes of perceptions as delineated earlier. However, the mean values of items in three variables appended to this paper revealed that academic staff positively perceived the ethical practices at workplace. Employees acquaint with different work cultures and they have similarities in their perceptions regarding workplace ethics. However, they would change their standpoints while consider the influence of ethical practices at workplace. Hence, this study discussed the perceptional similarities of employees in the universities of Saudi Arabia on workplace ethics. Study results revealed that academic staff positively perceived the ethical practices at workplace. They differed highly in their views on three variables and had less proximity in their opinions. 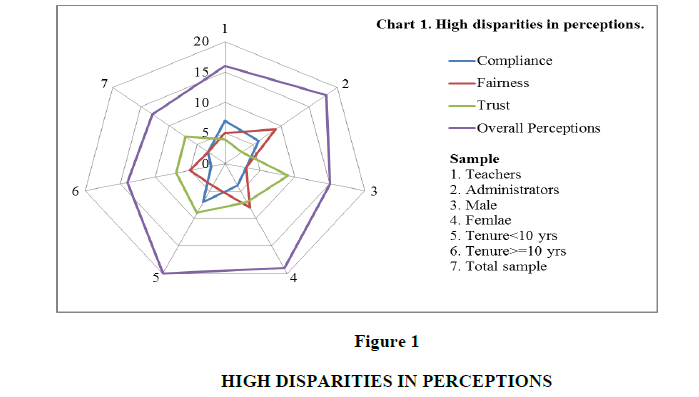 Perceptional disparities found in trust than in ethical compliance, and fairness. Proximity is only in trust. Both teachers and academic administrators contrasted rather neighbouring in their opinions on three variables. By gender, female staff looked like highly contradictory and had more intimacy in their overall opinions on three variables than male staff. However, male staff moderately responded to three variables and therefore their responsiveness intensified in both cases of resulted high disparities and close proximities. Those tenured less than 10 years were responsively more volatile besides slightly stable in their opinions on three variables than tenured 10 years or more. Eventually, statistically significant variance was triggered only in trust because of unrestrained high disparities ensued among male staff, teachers, and tenured 10 years or more. However, there was no significantly identifiable variance instituted with regard to ethical compliance and fairness. Descriptive statistics predicted ample variance in the overall perceptions of academic staff especially on trust and fairness but not on ethical compliance. Since, more high disparities in the positive perceptions are resulted in three variables; this study would propose to bring consensus among academic staff regarding workplace ethics. However, this study felt that participants from different socio-cultural backgrounds would differ highly on ethical practices as might be witnessed in this study. Hence, authors suggest that educational institutions in Saudi Arabia could follow the cross-cultural approach in the formulation and implementation of ethical practices at workplace. Even though academic staff of universities positively perceived the ethical practices at workplace that related to three study variables, the results revealed that ample high perceptional disparities were apparent among the academic staff by occupation, gender, and tenure. However, little high propinquity in the perceptions was also resulted among them. Overall, academic staff varied aberrantly in their views than uniformity in their positive opinions on workplace ethics. Explicitly, about ethical compliance at workplace, academic staff highly differed by occupation followed by tenure and gender. About fairness at workplace, they remarkably altered their feelings by occupation followed by gender and tenure. On the subject of trust at workplace, they exceptionally diverse in their views mainly by gender and tenure followed by occupation. However, academic staff more immensely confirmed their close perceptional proximity by occupation and gender. Less number of high propinquities resulted among them by tenure. Certainly, from the viewpoints of academic staff, the inferences of this study revealed that there was a dominant climate of workplace ethics at universities in Saudi Arabia. In fact, this paper communicated only the excessive autonomy of perceptional similarities. Implications of this study are to realize and fetch the unanimity among academic staff of education institutions for the successful implementation of ethical practices at workplace. This study did not discuss the perceptions based on cross-cultural backgrounds of participants, it did not cover the details of work culture of universities, and it did not linkup the ethical policies of universities in Saudi Arabia to address the implications of this study. It covered only sample of participants from selected universities. Therefore, the results may not be implied to the opinions of academic fraternity of universities in Saudi Arabia. However, further research on this subject of workplace ethics would lead to overcome these limitations. Alias, M., Rasdi, M.R., Ismail, M. & Samah, A.B. (2013). Predictors of workplace deviant behaviour: HRD agenda for Malaysian support personnel. European Journal of Training and Development, 37(2), 161-182. Blum, A. (1988). Ethics at the workplace. Journal of Business Ethics, 7(4), 259-262. Cohen, A. & Vigoda, E. (1999). Politics and the workplace: An empirical examination of the relationship between political behaviour and work outcomes. Public Productivity & Management Review, 22(3), 389-406. Cohen-Charash, Y. & Mueller, J.S. (2007). Does perceived unfairness exacerbate or mitigate interpersonal counterproductive work behaviours related to envy? Journal of Applied Psychology, 92(3), 666-680. Kramer, R.M. & Tyler, T.R. (1998). Trust in organizations: Frontiers of theory and research. Business Ethics Quarterly, 8(2), 319. Dandan, M.M. & Marques, A.P. (2017). Higher education leadership and gender gap in Jordan. Asian Development Policy Review, 5(3), 131.139. Ergas, O. (2017). Reclaiming ethics through self: A conceptual model of teaching practice. Teaching and Teacher Education, 68, 252-261. Fantazy, K. & Al-Althmay, A.A.A.R.A. (2014). Ethics and religion in higher education. International Journal of Commerce and Management, 24(2), 180-196. Ferguson, E., Kerrin, M. & Patterson, F. (1997). The use of multi?dimensional scaling: a cognitive mapping technique in occupational settings. Journal of Managerial Psychology, 12(3), 204-214. Gilliland, S.W. & Langdon, J.C. (1998). Creating performance management systems that promote perceptions of fairness. Performance appraisal: State of the art in practice. Grant, A.M. & Ashford, S.J. (2008). The dynamics of proactivity at work. Research in Organizational Behaviour, 28, 3-34. Heilman, M.E. (2012). Gender stereotypes and workplace bias. Research in Organizational Behaviour, 32, 113-135. Khan, T. (2014). Job Satisfaction and Job Performance, a Study on Colleges of Saudi Arabia. Journal of Scientific Research and Reports, 3(23), 2972-2981. Nair, S.M., Hanafi, Z & Yassin, S.M (2017). Do Preschool Teacher's Education Affect their Classroom Practices and Career Paths? International Journal of Education and Practice, 5(6), 88-94. Ngang, T.K. & Chan, T.C. (2015). The importance of ethics, moral and professional skills of novice teachers. Procedia-Social and Behavioural Sciences, 205, 8-12. Olson, S. (2013). Shaping an ethical workplace culture. USA: SHRM Foundation. Phillips, L.T., Weisbuch, M. & Ambady, N. (2014). People perception: Social vision of groups and consequences for organizing and interacting. Research in Organizational Behavior, 34, 101-127. Putranta, M.P. (2010). The relationships between ethical climates, ethical ideologies and organisational commitment within Indonesian higher education institutions. Journal of Academic Ethics, 9(1), 43-60. Schwartz, B. (2011). Practical wisdom and organizations. Research in Organizational Behaviour, 31, 3-23. Stefan, T., Crossley, C., Bennett, R.J. & Sczesny, S. (2007). The relationship between trust, attachment and antisocial work behaviors. Human Relations, 60(8), 1155-1179. Thomas, S. & Kamalanabhan, T.J (2012). Measuring emotional intelligence of the workplace. International Journal of Business Innovation and Research, 6(4), 418.